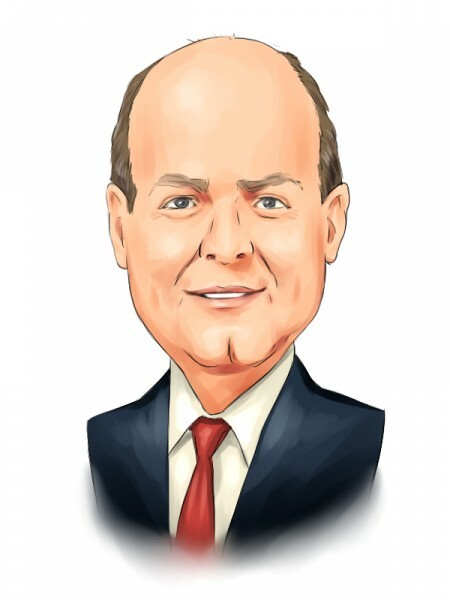 Is Realty Income Corp (NYSE:O) a good equity to bet on right now? We like to check what the smart money thinks first before doing extensive research. Although there have been several high profile failed hedge fund picks, the consensus picks among hedge fund investors have historically outperformed the market after adjusting for known risk attributes. It’s not surprising given that hedge funds have access to better information and more resources to find the latest market-moving information. The smart money is noticeably underweight shares of Realty Income Corp (NYSE:O), owning just 0.90 % of them in the middle of 2018. Hedge fund ownership of the stock has also fallen by 20% in the past two quarters, which is somewhat surprising given the attractive 4.39% dividend yield that Realty Income shares carry. The company has also paid out dividends for the last 25 years, ranking it as one of the 25 Best Dividend Stocks for Retirement. How have hedgies been trading Realty Income Corp (NYSE:O)? At Q3’s end, a total of 15 of the hedge funds tracked by Insider Monkey held long positions in this stock, a 6% dip from the previous quarter. 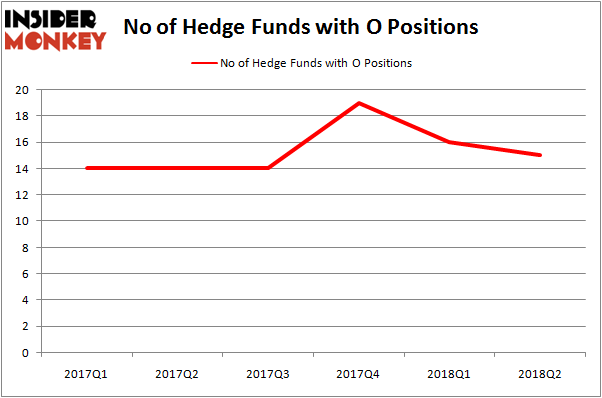 The graph below displays the number of hedge funds with bullish position in O over the last 6 quarters. So, let’s see which hedge funds were among the top holders of the stock and which hedge funds were making big moves. Of the funds tracked by Insider Monkey, Dmitry Balyasny’s Balyasny Asset Management has the largest position in Realty Income Corp (NYSE:O), worth close to $36.7 million, accounting for 0.2% of its total 13F portfolio. On Balyasny Asset Management’s heels is Citadel Investment Group, led by Ken Griffin, holding a $23.4 million position; the fund has less than 0.1% of its 13F portfolio invested in the stock. Remaining professional money managers that are bullish consist of Matthew Tewksbury’s Stevens Capital Management, Paul Tudor Jones’ Tudor Investment Corp and Michael Platt and William Reeves’ BlueCrest Capital Mgmt. Since Realty Income Corp (NYSE:O) has witnessed bearish sentiment from hedge fund managers, it’s safe to say that there exists a select few hedgies who sold off their full holdings last quarter. Interestingly, Matthew Hulsizer’s PEAK6 Capital Management dropped the biggest investment of the 700 funds monitored by Insider Monkey, totaling close to $3.3 million in stock, and Richard Driehaus’ Driehaus Capital was right behind this move, as the fund sold off about $2 million worth. These moves are important to note, as aggregate hedge fund interest was cut by 1 fund last quarter. Let’s also examine hedge fund activity in other stocks similar to Realty Income Corp (NYSE:O). These stocks are NASDAQ OMX Group, Inc. (NASDAQ:NDAQ), McCormick & Company, Incorporated (NYSE:MKC), Evergy, Inc. (NYSE:EVRG), and American Water Works Co., Inc. (NYSE:AWK). This group of stocks’ market values are closest to O’s market value. As you can see these stocks had an average of 21 hedge funds with bullish positions and the average amount invested in these stocks was $672 million. That figure was $138 million in Realty Income Corp’s case. Evergy, Inc. (NYSE:EVRG) is the most popular stock in this table. On the other hand NASDAQ OMX Group, Inc. (NASDAQ:NDAQ) is the least popular one with only 18 bullish hedge fund positions. Compared to these stocks Realty Income Corp (NYSE:O) is even less popular than NDAQ. Considering that hedge funds aren’t fond of this stock in relation to other companies analyzed in this article, it may be a good idea to analyze it in detail and understand why the smart money doesn’t see much value in Realty Income Corp despite its dividend history.